This worksheet is a reading comprehension. It contains three exercises: one which are questions about the text, multiple choice and true or false questions. 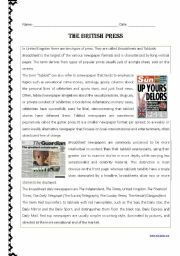 It´s an easy reading comprehension about the British press. All the info has been extracted from wikipedia and the quesions are very easy. I hope you like it! This is a Reading comprehension about teens and the music they listen to. 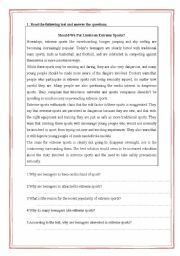 This worksheet has 2 exercises: one of multiple choice and secondly, a true or false activity. 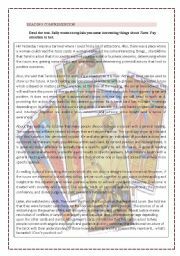 It´s an easy reading comprehension about Tarot. It has True/ False exercise and questions. I hope you like! It is a worksheet with activities of reading comprehension, fill in gaps, true or false, writing, etc... to prepare selectividad. 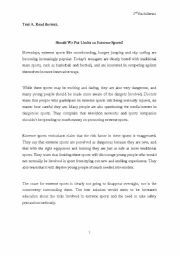 It is more complete than the other calls "extreme sports". 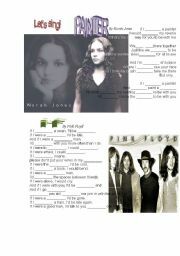 These are songs from Norah Jones´ "painter" and Pink Floyd´s "if". This exercise is to fill the blanks. Very easy. I hope you like it! 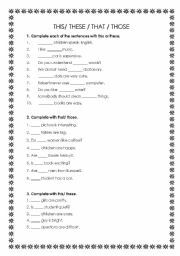 Easy worksheet for elementary level. Students will practice the differences between this-that-these- those. It´s very basic. It´s the song sung by Joe Cocker. I work "would" in questions. I hope you like! 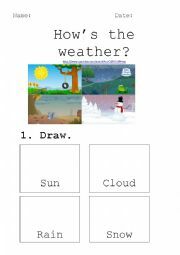 It´s a worksheet to practice weather´s vocabulary. I hope you enjoy! The type of the letter I used is "Escolar 1". It´s a very useful fash-card that I use in my class to teach the alveolar sounds.I hope you like it!